Maybe you do not know about air fryers. Air is the new oil! 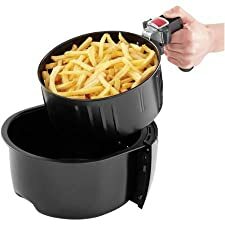 Air fryers resemble deep fryers in that individually they both cook up vegetables, meat, poultry, and fish to a crispy crunchy outside while cooking the inside done. You can also cook vegetables and fruits, such as apples with cinnamon and sugar, crisp tender. 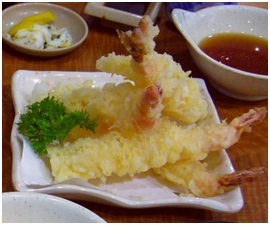 They both would make excellent Japanese tempura, a delicious crispy deep-fried vegetables or seafood in a light, distinctive batter. An air fryer will sit on your kitchen counter top taking up a smaller amount of space than a deep fryer. It still has a large capacity, minus all the oil, and can have a capacity of 1.5- up to 2-pounds and more for meat. Depending on the weight for the foods you use, the pot will usually hold from 2 to 12 cups. A 6-cup air fryer will feed two people. A good fryer can cost from $65 to $150 and they even go as high as $300+. The price is contingent upon the added options the air fryer delivers. Air fryers that cost in the mid-hundreds would be the most current model fryers that can either be analog or digital. All air fryers yield the same results and the more the price the more features you will get and pay for. 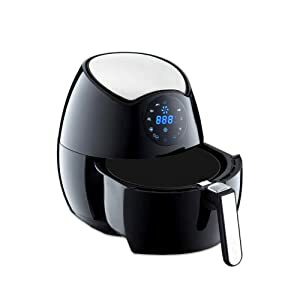 The top best air fryer reviews below will give you an idea for excellent ones to fit your budget in the mid-price range under $200. That’s all there is to it and you’ll be eating in about 30-minutes. All air fryers, grill, fry, roast, and bake. Black & Decker® has been making power tools, outdoor yard care equipment, coolers, and accessories since 1910, to include small kitchen appliances. 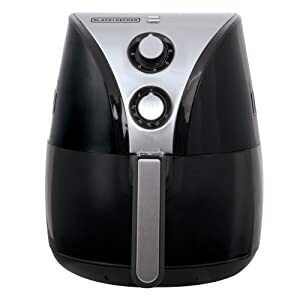 The Black & Decker® model HF110SBD 2-liter (2.11-quarts/8-cups) oil-free air fryer in stainless-steel and black plastic is a top seller on Amazon.com®. You will have out-of-this-world crispy outsides with soft tender insides without added fat. The fryer is 8-inches diameter and 5-inches high. It browns the tops of food and then you have to flip the food for browning on the bottom. The fat falls through the holes into the bottom that you dispose of. The temperature goes from 175- to 400-degrees F. with the 60-minute timer turning the unit off automatically when your cooking time is up. So, cook up a dinner or snacks using the full-size or even lower amounts in the frying basket using the fryer that has 2 convection fans for preheating quickly, then cooking. You will need little to no oil. The unit has heating and power indicator lights so that you can see at a glance what mode is functioning. You will appreciate the non-stick basket, separator, and pan for easily cleaning up after dinner. The basket and separator are dishwasher safe. The housing with electrical components must be cleaned by hand. Make French fries, burgers, vegetables, and more. There is not much the Black & Decker® won’t do. Plug the UL® listed cord into a USA 110/120, 50/60 Hz-Volt outlet. Outside the USA you will need to buy a 220/240-Volt adapter. The power is 1200-Watts. Included are the User’s Manual, adapter, and basic cookbook. BLACK+DECKER (U.S.) Inc., warranties this product to be free from defects in material or workmanship for a period of 2 years following the date of purchase, provided that the product is used in a home environment. It is made in China. How to Use BLACK+DECKER video. The Kalorik air fryer model number FT 42139 BK has 2 layer of racks in a black outside with silver trim. It will look nice on your countertop with its good looks. This unit has several functions with its rapid air circulation process that gives your food a crispy outside with its tender inside treat. It cooks 28-ounces of food. You will not have an oil odor, there is no splattering because there is no oil, so enjoy your no-fuss no-mess grilling, roasting, frying, and baking. The temperature control goes to 400-degrees F. and the timer can be set for 30-minutes. It cooks fast holding 3 liters (3.2 quarts). The large basket holder has a non-stick coating and is approved by the FDA (Food and Drug Administration) in the USA. It will cook fast and the basket and basket holder are dishwasher safe. The housing cannot be put in the dishwasher due to the electronics inside. It will hand wash easily with detergent and warm dishwater. The unit has a thermal overload protector to shut it down if it gets too hot. The handle and housing stay cool to touch so you will never be burned. Another safety feature is that it has a protective circuit where you can open the basket to check your food at any time. It easily holds 2-pounds total of meat and veggies, or just meat, fish, or poultry. With the 2 layer racks, you can cook your veggies at the same time separately. Whip up French fries, onion rings, burgers, steaks, Mexican, and Asian dishes quickly. Bread your pork chops and grill some potatoes and carrots for a delicious dinner tonight. The built-in timer automatically shuts the fryer off. The dimensions are 15.1-inches tall x 11.2-inches tall weighing 15.4-pounds. Plug the UL® listed cord into a USA 110/120, 50/60 Hz-Volt outlet. Outside the USA you will need to buy a 220/240-Volt adapter. You will receive the dual-layer rack and a 25+ recipe book with a User’s Manual. The Kalorik air fryer has a 1-year Warranty from the date of purchase against defects in material and workmanship. It is made in China. Tempeh Air-Fried/Kalorik Air Fryer video. 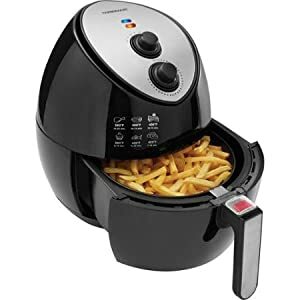 The NutriChef™ by Sound Around, Inc., is a digital electric air fryer, model number PKAIRFR42, with its dual fry baskets gives you quick and easy cooking every time you use it. Simply put your food into the Teflon® coated basket(s) and set the time and temperature for a delicious dinner without the oils. With the convection style vortex circulation, you will have your meals ready in about 30-minutes. The basket has holes in the bottom to drip grease into the lower unit. It shows clever icons of the food you want to fry and the unit beeps to let you know it’s done. The black and silver-gray unit will sit on your countertop with its basket and frying container sliding out for easy filling of food such as all vegetables, fish, other seafood, poultry, and meat. You can bread meats for a crispy crunchy outside with a juicy center. Prepare French fries, onion rings, and potato skins for an enjoyable meal. The air fryer will fry, roast, bake, broil, grill, and barbeque. 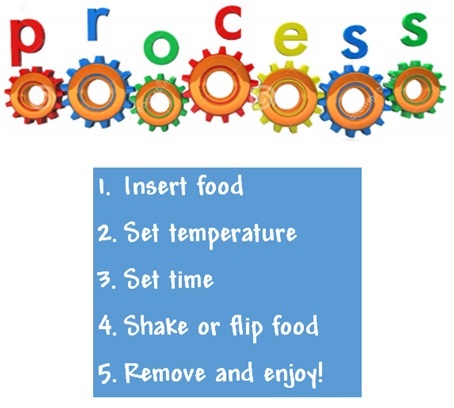 There are preprogrammed cooking modes that are convenient to use when in a hurry. Make a stack of crispy coconut shrimp without all the oil and grease used in a deep fryer. You can also make desserts and pastry soufflés. The frying basket will hold 3.4 quarts and the non-stick pans will hold 4.2 quarts. You can fry in both at the same time. Plug the UL® listed 4.6-foot cord into a USA 110/120, 50/60 Hz-Volt outlet. Outside the USA you will need to buy a 220/240-Volt adapter. The power is 1400-Watts. You will receive the dual-layer racks and a User’s Manual. 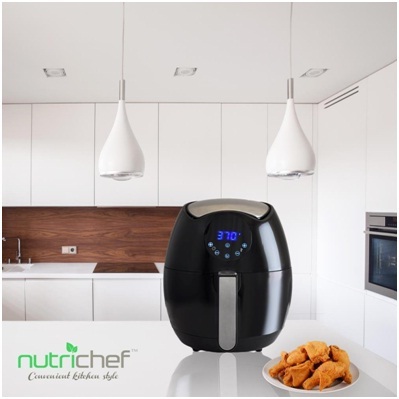 The NutriChef™ air fryer has a 1-year Warranty from the date of purchase against defects in material and workmanship. It is made in China. NutriChef Digital Electric Air Fryer video. The Philips original Viva Collection fryer is model number HD9220/28, black plastic, and a best seller on Amazon.com®. You will fry with 75% less oils or fats with this air fryer. You can fry food with less than one tablespoon of oil for a health-conscious meal. The unit is black and silver plastic with feet. It holds 800 grams and that is not quite a liter of 1000-grams/1.77-pounds. Internationally renowned chef Gordon Ramsay, united with Philips Air Fryer to produce a 150-recipe cookbook that you will receive with your air fryer that are delicious and fast to cook in this fryer. It will cover breakfasts, dinners, deserts and more. People using this fryer are happy with over 7 million having been sold. 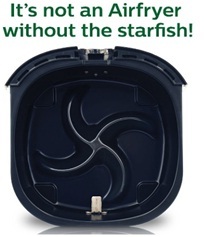 The fryer is fast using its starfish pattern in the bottom of the frying container. The design lets air circulate around evenly to give you the crispy results you like while being tender and juicy on the inside. The unit will roast, grill, steam, and bake for best results for family and friends. It will even fry bacon a few strips at a time and a small pizza. The fryer will hold 1.75-pounds of French fries that will be crispy and tender inside. Just add salt and vinegar or catsup and enjoy! Simply set the timer for up to 30-minutes and the automatic shut-off will beep to let you know time’s up. It will also give you a ready signal. The temperature is 390-degrees F. to give you crisp chicken, meats, and more. You will never smell grease boiling with this air fryer since it uses none. The housing stays cool and has feet that will never slip or slide on your counter surface. You can put the non-stick drawer and 28-ounce food basket in the dishwasher for safe cleaning. Wrap the cord around the storage brackets when not in use; never leave it plugged into the wall receptacle for safety. Plug the UL® listed cord into a USA 110/120, 50/60 Hz-Volt outlet. Outside the USA you will need to buy a 220/240-Volt adapter. The power is 1425-Watts. The dimensions are 11-inches long x 12-inches wide x 15-inches high and it weighs 15-pounds. You will receive the cookbook and User’s Manual. The Philips air fryer has a 1-year Warranty from the date of purchase against defects in material and workmanship. It is made in China. Philips | Gordon Ramsay, Chef, Kale, and Chicken Salad Recipe video. 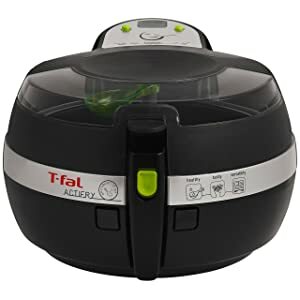 The t-fal® air fryer model number BF6520004 will make 4 portions without a problem. You will enjoy cooking not needing to stand over the unit. You won’t need to preheat, shake, or stir, although you will receive a stirring paddle if you need to flip something over. You can see what’s cookin’ through the lid using the push button to open the lid that does not collect steam. The lid, paddle, and basket are all dishwasher safe. The fryer comes with a free recipe booklet for great dishes including Mediterranean. You can use only 1 spoon of oil for health. 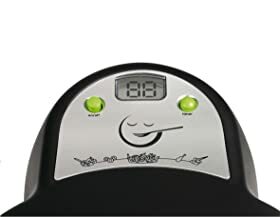 The timer is digital with an LED timer and beeper to let you know your food is finished cooking. It is distinctive with its pulse heat system to cook your foods the way you like them. The crispy coating and moist insides of food is great with this air fryer. French fries are a snap to do. Put 2-pounds of frozen or fresh cut potatoes into the pan, add a tablespoon of oil, then set the timer and wait for the beep that the fries are done to perfection. It heats to 374-degrees F.
Plug the UL® listed cord into a USA 110/120, 50/60 Hz-Volt outlet. Outside the USA you will need to buy a 220/240-Volt adapter. The power is 1700-Watts at 15-Amps. The dimensions are 11.75- x 19.1- x 15.6-inches and it weighs about 10-pounds. You will receive the cookbook and User’s Manual. The t-fal® air fryer has a 1-year Warranty from the date of purchase against defects in material and workmanship. It is made in China. How to Fry Shrimp Video. The Gourmia® electric air fryer has 4 preset functions using only 1 button and an LED display screen with adjustable temperature controls. The model GAF520 is a best-selling air fryer on Amazon.com® holding 4.5-quarts of food. The reasons are many with its various features. The frying basket is included along with a free recipe book. Be creative and bake, roast, fry, and grill your favorite dishes in a matter of minutes. The unit is a cool black plastic with silver. With the preset modes, you can prepare fries, poultry, fish, beef, and pork, or you can set your own temperature and time for the amount you are cooking, with minimal oil. Remember that the basket is removable so you can take your food easily from your air fryer to the serving dish. 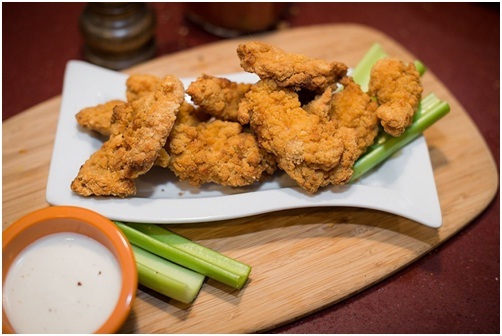 Want to try some of these recipes myself, especially the chicken wings. 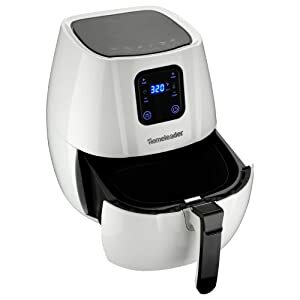 The Gourmia® Free Fry Air Fryer Pro utilizes RadiVection 360-degree Technology that uses the efficiency of turbo charged convection cooking with infra radiant heat for hot air cooking. With heated air, you won’t need fattening oils. The air fryer fries up foods and meat as good as a deep fryer without the bad health results of excess belly fat. Even more, you don’t have to clean up the greasy mess for an hour of your time. Plug the 3-foot UL® listed cord into a USA 110/120, 50/60 Hz-Volt outlet. Outside the USA you will need to buy a 220/240-Volt adapter. The power is 1400-Watts. The unit is ETL® (Electrical Testing Laboratories) certified meaning it has passed a safety inspection for your confidence in buying safely in the USA and Canada. The dimensions are 13- x 11- x 12.5-inches weighing 11-pounds. You will receive the cookbook and User’s Manual. The Gourmia® air fryer has a 1-year Warranty. It is made in China. Farberware® has been making appliances, cookware, bakeware, kitchen appliances, cutlery, and kitchen gadgets for over 100 years. The multi-functional no splattering mess found with other fryers is welcomed by all cooks. The model number HF-919B is a black plastic shiny housing with dials and food icons trimmed with a soft matte silver color. 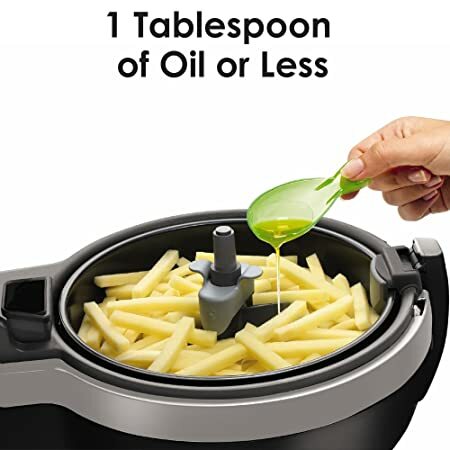 Bake, fry, grill, and roast with this multi-faceted unit using a little oil or no oil as your preference dictates. Your meat, fish, poultry, and fried foods will come out crispy, crunchy, to be well done, juicy, and tender. Vegetables will turn out great as well using fresh or frozen to include onion rings, hash browns, and potato cakes. The hot air circulates and all you need to do is open the tray and flip the food over. Whip up crisp veggies like kale chips, homemade sweet potato or apple chips, potato chips and more. Why not try tortilla chips? It will handle dry bread batters, but not the wet batters. It will also fry bacon all crispy and brown. Hot dogs are perfected better than grilling them. Make the prefect golden brown salmon patties like grandma made for us. Bread your shrimp, pork chops, hot wings, and enjoy tender steaks, and roasted potatoes so delicious and crusty. The temperature control and 30-minute timer are the top knobs. The timer uses increments of 10-, 15-minute and other increments. The basket will hold 1 liter/2.2-pounds/900 grams. The 3.2-quart food basket and holder cleans up like a charm in your dishwasher. The housing can be wiped down with sudsy dish water to sparkle again. The unit shuts off automatically when the time is up. The food basket is approved by the FDA and uses a non-stick coating that is not Teflon®. Cook with health in mind having fewer calories from fats in grease. Just a dab of oil will do it every time. The feet on the bottom will hold the unit securely on the counter top and will never slide or slip. The housing and handle are cool to the touch. With the plastic cover on the food basket, the red release button keeps the basket from sliding out and falling. Check out how to fry donuts in the free cookbook that comes with the air fryer. Then put icing on them for you and the kids. Plug the UL® listed cord into a USA 110/120, 50/60 Hz-Volt outlet. Outside the USA you will need to buy a 220/240-Volt adapter. The power is 1400-Watts. The dimensions are 26.6- x 14- x 13-inches weighing 11.8-pounds. You will receive the cooking booklet and User’s Manual. 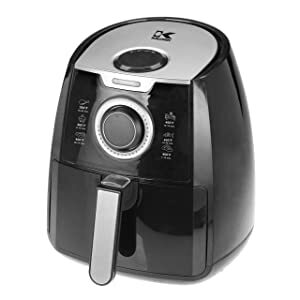 The Farberware® air fryer has a 1-year Warranty. It is made in China. Farberware Air Fryer Instructions video. 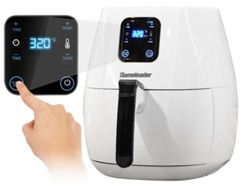 The Homeleader brand located in China makes a 2.65-quart multi-air fryer with digital LED touch controls to set the temperature to 400-degrees F. in 5-minute increments from 1- to 30-minutes for the timer. It also has adjustable start delay from 0.5- to 12-hours in 30 minute increases. The model number K58-017 white unit with black baskets uses 70% less oil with its fast-hot air movement cooking your food the way you like it. It comes with 1 air fryer and 1 basket non-stick. It creates no smoke and no grease to clean up. The basket release with safety cover prevents accidental dislodging of the basket for the contents to fall out. The basket and fry unit go into the dishwasher for easy and quick cleaning. The unit has the automatic shut off feature with a buzzer sound to let you know your food is ready to eat. The heater and timer will be disabled when removing the basket/container as a safety device. The fryer will stay put on your counter with its rubber feet. Roast, bake, fry, and grill for your risotto, veggies, meats, chicken, and fish. A free cookbook comes with the unit for even more ingenious dishes. Just use a spray of oil for the bottom or drizzle a tablespoon over your meats. 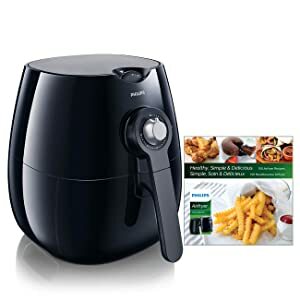 Cook frozen foods, chicken nuggets, French fries, mini pizzas, and more with this impressive air fryer without grease and fat. Use fresh or frozen foods in your fryer, but defrost meats, poultry, and fish first. The dimensions are 13.6-inches wide x 13.6-inches front-to-back x14.2-inches high and weighs about 7.7-pounds. The frying basket inside dimensions are 7.7-inches wide x 7.5-inches high x 3.6-inches deep. Plug the 3.2-foot UL® listed cord into a USA 110/120, 50/60 Hz-Volt outlet. Outside the USA you will need to buy a 220/240-Volt adapter. The power is 1300-Watts. The unit is ETL® (Electrical Testing Laboratories) certified meaning it has passed a safety inspection for your confidence in buying safely in the USA and Canada. Gift-wrapping is available for your loved ones, family, and friends. This would be a nice gift for those living on campus at college. You will receive the Homeleader air fryer, baskets, free recipes, User’s Manual, and a 30-day Money Back Guarantee. The Operating Instructions are written in English, German, Italian, Spanish, and French. A 12-month replacement Warranty and lifetime support Guarantee is provided as well. The air fryer is made in China. Demonstration for French Fries Using the Homeleader Air Fryer video. 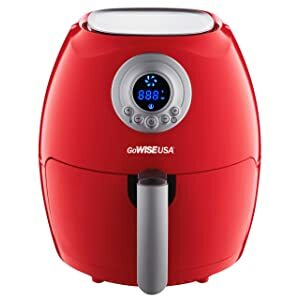 The GoWISE USA® air fryer model number GW22633 comes in chili red, white, or black. It holds 2.75-quarts and has baskets for all the things you love to cook and eat without the fats. You will have no more soggy foods using the hot air circulation process in this fryer. Decide if you want to fry, roast, grill, or bake and this fryer will do it all for you in a jiffy. Have your French fries, onion fries, and taco filling made to perfection. It will make delicious burgers, chicken, fish and other seafood, beef and pork including more than that! You can fry 2 thighs and 2 legs or 4 thighs at a time. Fried okra comes out great if you cook it a bit longer. A convenient quick cooking guide is located on the top of the unit. The non-stick basket comes out and a safety button is at the top to prevent it spilling out the food inside. The recipe book that is included will give you more ideas for cooking other dishes. You can warm your crispy leftovers to have them once again be crunchy and juicy inside. You can adjust the cooking temperature from 175- to 400-degrees F. and set the timer for up to 30-minutes. It has an automatic standby mode that goes into this mode when the cooking time is finished. A red dot during the cooking cycle does not apply to this size unit, so please disregard that in the instruction manual. It is easy to clean by simply putting the basket into the dishwasher and wiping down the outside housing with a soapy cloth, rinse, and dry. Plug the UL® listed cord into a USA 110/120, 50/60 Hz-Volt outlet. Outside the USA you will need to buy a 220/240-Volt adapter. The power is 1350-Watts. The unit is ETL® (Electrical Testing Laboratories) certified meaning it has passed a safety inspection for your confidence in buying safely in the USA and Canada. The dimensions are 11- x 8- x 6-inches. The basket dimensions are 3-3/4- x 7-1/2-inches and the entire unit weighs about 10-pounds. You will receive the cook booklet and User’s Manual. 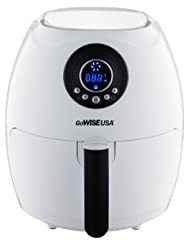 The GoWISE USA® Air Fryer has a 1-year Warranty. It is made in China. 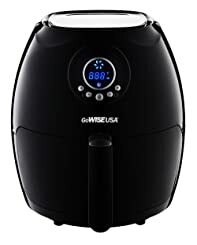 The GoWISE USA® Air Fryer video. 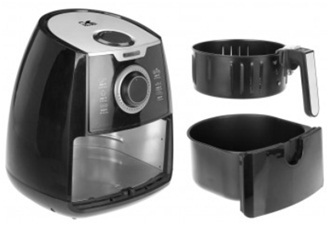 The Avalon Bay air fryer model AB-AIRFRYER100B is made of black plastic with silver accents. It is also available in red, silver, and white. This is an avant-garde way to cook and it’s very trendy today giving you the crispy tender morsels you grave. So, use less oil for a healthier way to live and enjoy the fork-tender insides of meat with the crispy outside. Without the grease, you won’t have that greasy after taste in your mouth that sometimes sticks to the roof. The small amount of oil you do use and residual grease in meat will drop through the holes in the non-stick basket to the lower chamber. The heating element is made from 304 stainless-steel. The controls are analog (knobs), not digital. Air fryers use the same technology as convection ovens—hot hair blowing around inside to do the task. The 30-minute timer can be controlled by you and the temperature range is from 200- to 400-degrees F. adjustable by you as well. The unit will make a ding sound and then shut off automatically when your food is finished cooking. The basket has a quick release for safely removing it. With its thermal overload protector, it will shut down if it becomes too hot for safety. Reheat your leftovers confidently with the 3.2-liter (3.4-quarts) mesh metal basket the same as when you prepared it the first time. Clean the baskets in the dishwasher but wash the outside with a dish cloth in soapy water. The rubber feet hold the fryer snugly and securely to your countertop. The top handle makes it portable and easy to move to a shelf in your kitchen or take to an event. 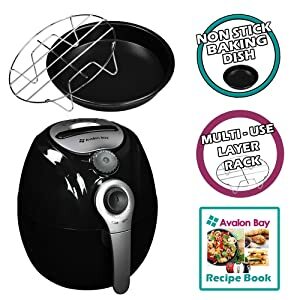 The creative free cookbook covers a variety of over 20 meals, appetizers, entrees, desserts, and snacks to make in your air fryer from Avalon Bay. 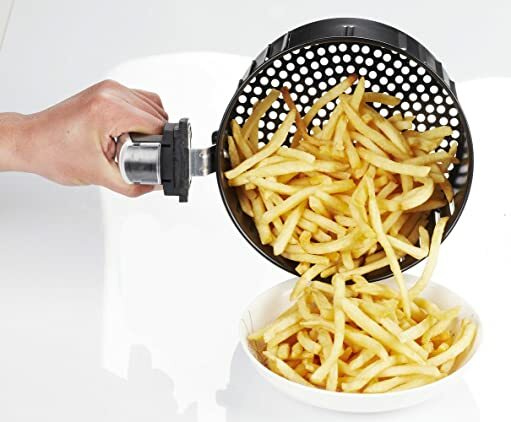 The removable mesh metal basket makes it easy to transfer from the fryer to serving dishes. It has infinite cooking options with its removable baking pan and rack. Serve up crispy meats, tender on the inside chops and steaks, egg rolls, and anything you’re set on cooking. The sky is the limit. Plug the UL® listed cord into a USA 110/120, 50/60 Hz-Volt outlet. Outside the USA you will need to buy a 220/240-Volt adapter. The power is 1400-Watts. The unit is ETL® (Electrical Testing Laboratories) certified meaning it has passed a safety inspection for your confidence in buying safely in the USA and Canada. The dimensions are 13.50-inches long x 11-inches wide x 12.75-inches high and weighs 11 pounds. You will receive the recipe book, baking set, and User’s Manual. The Avalon Bay Air Fryer has a 1-year Warranty. It is made in China. 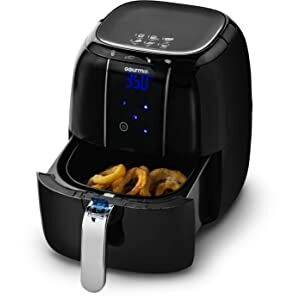 Avalon Bay Air Fryer Review video. Do not use Crisco or lard in air fryers. Use only olive oil or what the User’s Manual suggests. Best oils are olive, grape see, walnut, peanut, canola, safflower, sunflower and the like. Cooking sprays work well too, such as Pam®, and spray olive oil. Outside the USA you will need to buy a 220/240-Volt adapter. The USA uses 110/120-Volts. It is not recommended to fry sausage in air fryers due to the grease content. Shake or flip the food to be sure it’s cooked all over. Don’t overfill your fryer basket. It can cause the unit to overheat and burn out. If you need more cooking space, it would be best to buy a bigger air fryer. 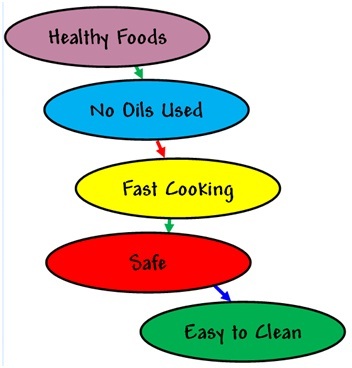 Cooking spray oils are better than drizzling oil for good food. We hope this has been helpful for you to decide what to buy for you and your family. 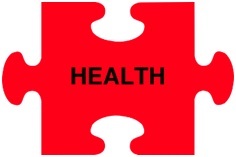 Happy shopping and happy health with healthful foods. Mistake: GoWise has a warranty of 30 days for air fryers. I’ve read the warranty document. That doesn’t give one much confidence. I did not make a mistake stating the 1-year warranty. 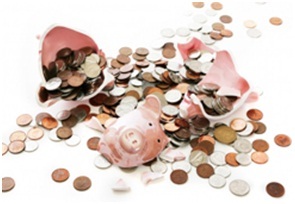 Most companies give only 30-days for warranties. Actually, a 1-year warranty is good these days. GoWISEUSA® has a 1-year limited warranty for all products. Products are warrantied against defects in materials and workmanship for 1-year from the date of purchase, when used in accordance with the instructions provided. This warranty does not cover damages or wear resulting from accident, misuse, abuse, commercial use, or unauthorized adjustment and/or repair. A proof of purchase is required to start a warranty claim. If it is a gift, please contact the gifter for a copy of the receipt. If it is inappropriate, you may request that the gifter open the warranty claim on your behalf. GoWISEUSA® shall not be liable for loss of use or any other incidental, consequential, or indirect costs, expenses, or damages. There are no express warranties except as listed above. This warranty gives you specific legal rights, and you may have other rights which vary from state to state. Hope this helps you to feel confident when buying this air fryer. Let me know. The part that holds the oil is plastic; the baskets that hold your food can be durable non-stick plastic or stainless-steel. For more detailed information, click on the Amazon link for each product you like and read more there. My reviews are a summary. You will love any of these air fryers as I do.